This beautiful design is so on-trend and just beautiful! Sure to set the stage for an absolutely spectacular wedding! So cool and organic-- perfect for your destination wedding or tropical wedding! RSVP card included in price (if you do NOT need the RSVP card, please contact me for custom pricing). 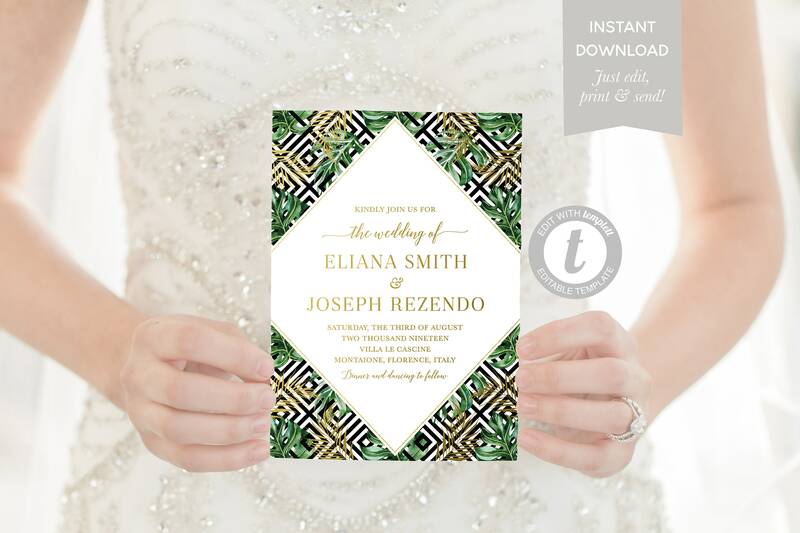 FREE overnight shipping for all printed invitations! Invitation and RSVP envelopes included free of charge. 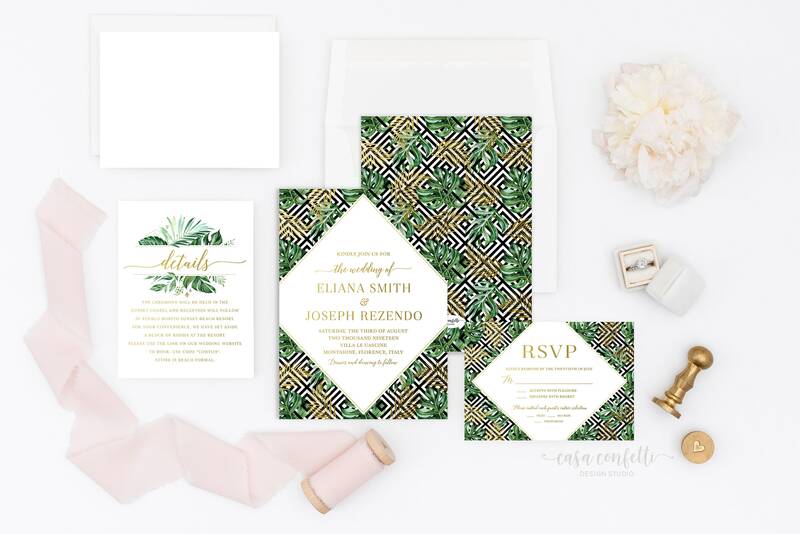 This listing allows you either: (1) to purchase your invitation and RSVP card as a digital file only, which you can then print yourself; or (2) to purchase as many PRINTED invitations and rsvp cards as you need. Simply use the drop-down menu to choose. 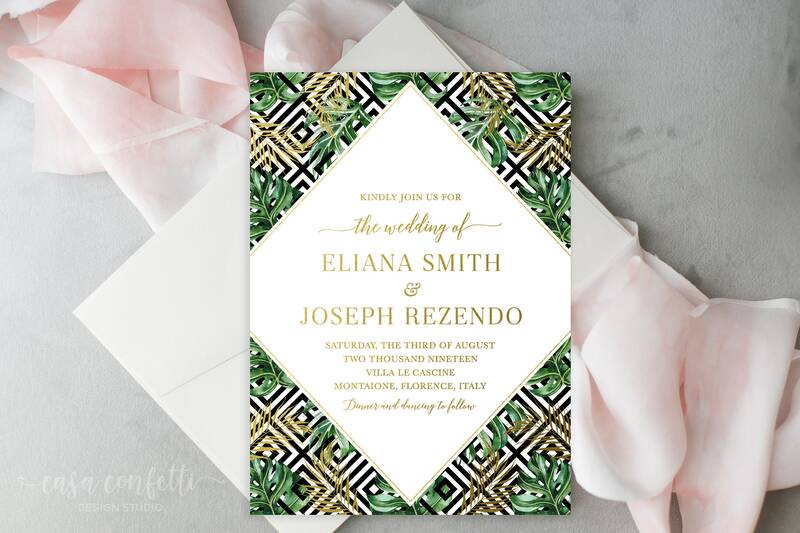 Both options include a FREE matching back for an elegant and polished look (and printed invitations include FREE overnight shipping and luxurious white envelopes for your invitation & rsvp cards). 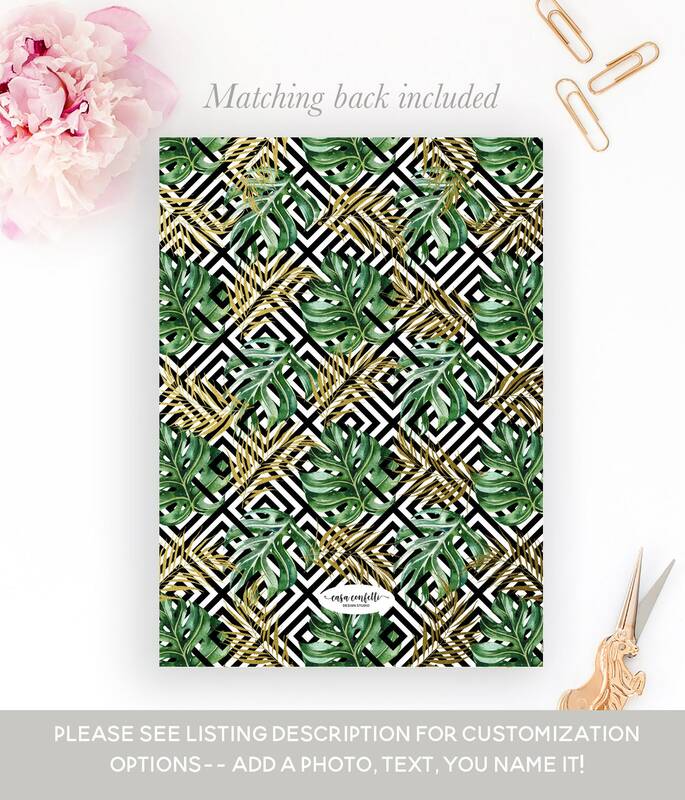 If you need any coordinating items, like details cards, thank you cards, and more, you’ll find everything you need in the "Made to Match" section of my store: https://www.etsy.com/shop/CasaConfetti?ref=hdr_shop_menu§ion_id=18513363. PRINTED invitation & RSVP sets start at $2.60 per set (for 250 invitations). Invitations and RSVP cards are printed on luxurious, ultra-thick card stock (design on front and back! ), and come with high-quality white envelopes for both. All orders include FREE overnight shipping via UPS!! This is really a great price for invitations of this quality. Please note: the smaller the print run, the higher the cost per invitation. For example, 25 invitation & RSVP card sets cost $95 ($3.80 per set), while 250 invitation & RSVP card sets cost $650 ($2.60 per set). Please convo me on Etsy if you need a quantity that is not listed in the drop-down menu. SIGNATURE: Thickest option, matte finish. Signature paper is an ultra-thick 130 lbs and has a soft, rich texture. This is as high-quality and luxurious as it gets! SHIMMER: Pearlescent finish. Shimmer paper is an ultra-thick 130 lbs and adds a nice, subtle shimmer to your design. Ultra-feminine and great with glittery and gold designs! STANDARD: Bright white, smooth finish. This paper is a bright white 120-lb card stock with a coated surface. It's great for showing off bold color contrasts and crisp text. All three options are super high-quality! You really can't go wrong. (2) Two high resolution, single-image JPEGs (one each for front and back). Invitations and rsvp cards come with ⅛” bleed around the edge. Use the JPEG files for best results when uploading to a website for printing, or to send as email/evite/text. Once I've received your order and personalization information, I'll customize your invitation and send you a proof to review within 2-3 days. RUSH orders of digital files are available for $10 extra, and proofs will be delivered within 24 hours -- simply purchase this listing in addition to the invitation: https://www.etsy.com/listing/467447990/rush-order-first-proof-within-24-hours?ref=shop_home_active_1. If you need an invitation sooner than that, please convo me before ordering. The turnaround time for proofs is the same as for digital files (within 2-3 days normally, and within 24 hours for RUSH orders, which can be purchased here: https://www.etsy.com/listing/467447990/rush-order-first-proof-within-24-hours?ref=shop_home_active_1).